I got a tiny bike computer to keep track of my stats. Cheap, handy accessory. I tried to get average speed to 11 but it’s going to be tough on this bike. That’s the idea, though. Have heard you’re not doing yourself much good if average speed isn’t somewhere between 10 and 15. 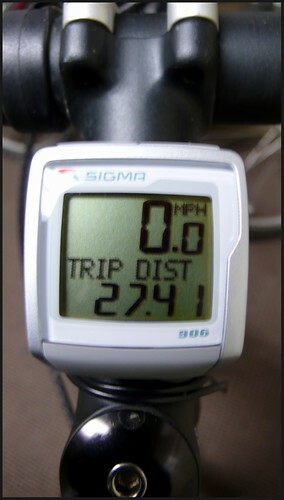 The top speed I made going down a puny hill at Medfra St. into the Chester Creek valley. The people I bike with sometimes on the weekend achieve 45 or more on steep descents, but I’m not that brave yet. Found out it’s exactly five miles to work, a little less than I had assumed. I’m going to try for a minimum of 100 miles a week, so I’m a bit behind. And maybe work my way up to 150 per week. If I do that for a couple months, that ought to scrub the spare tire.